Delightful cards! So many great details! I love your cards! The color really stands out against the black, and the colorful houses are so cute! I like to do complex, but it depends on time. If need be I will do CAS, although I’m not a big fan 8f my own CAS…I always feel like more is needed. Super awesome CAS cards! A super fun release! Love the cover plate, stitch lines…Thanks for the chance to win! 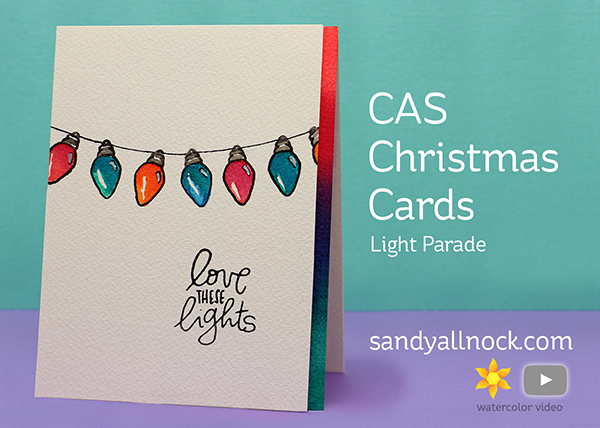 Love your card with the lights! Lovely and adorable cards. Love the watercoloring and pop of black too. It’s always fun to use the negatives of dies. Wow!! Wow!! Gorgeous cards!! Really love the black and colorful cards!! Fantastic!! I wouldn’t have thought to cut apart the houses…I love it!! Gorgeous cards, Sandy!!! The watercolors are just gorgeous!! I like to focus on CAS cards with a few detailed cards that I give to people personally. Lovely cards. Love the colors against black. Great coloring in both. I literally felt the light bulbs popping out and the car moving down hill! Gorgeous cards! I love the way the colors pop against the black. Beautiful cards. I like the lights and the one with the little car–very cute. I usually make a few special cards for family and more CAS-type ones for everyone else. I usually do Christmas cards with multiple steps. I like making many of the same card-enjoy the production process. Usually find one step takes more time than the others. Love your cards, especially the sloped village scene. Thanks for sharing! Thanks for giving us a variety of cards showing the new stamps and dies from Ellen. Super coloring as usual. Thanks. really do make a statement. Simple but powerful. Amazing cards as always! Your coloring is the best!! Your cards are stunning! I’m so glad the blog hop brought me here so I can follow you! I tend to make busier cards but the CAS is growing on me. Thanks for your participation! Wow – love the watercolor on the black geometric tree card. Looks like a church window at night lit by candlelight. Love the colors behind the tree die. I’m loving that non-traditional black card with the colorful tree. Those lights make me so happy. I need those lights soon!! And the houses on the hill with the little car are just too cute!! Awesome cards!! I would love to focus on CAS cards but I struggle with leaving them that way and they always end up more complex! I love the “Pile in the car” card!!! That hillside is genius. Thanks for sharing. So gorgeous! The black cards look like stained glass and the lights…so cute! Love that winter scene too! Awesome cards! Wow.. You really knocked these cards right out of the park!!!! Amazingly beautiful. You have such a talent. I love clean and simple cards, they look always chic and you can do more of them in less time. On other hand, they can be different from each other, and that’s beautiful too. More complex cards are for my closest friends and family sometimes. Wonderful and festive cards. Love your video. I love playing with watercolor backgrounds the way you did. I don’t have your inks, but you can do something similar with Distress Ink refill bottles. Love the snowy hill street card. So clever! My kids are old enough to write their own thank you cards now. I’d like to use these to make it a fun craft instead of a chore! 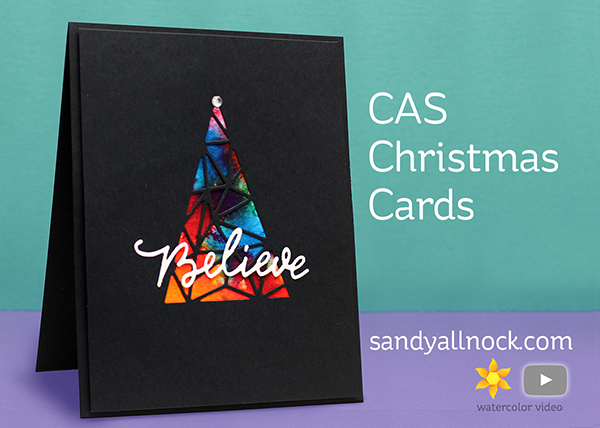 Great job on the cards, Sandy! Dramatic, simple, adorable, the whole gamut! Thanks so much for sharing with us and for participating in this great hop and giveaway. Love these cards! I think I’ll try to make some CAS Christmas cards this year. Stunning cards! Love the ones in black!! I think CAS can be so elegant and just like making them with a little pop of color as you mentioned. Wonderful inspiration and thanks for sharing your video. Love your water color cards, esp. the tree card. I love to make CAS cards. I really like CAS cards and your tips/techniques on how to achieve this are great. Adorable cards. Just love clean and simple cards. I love clean and simple cards. They need some pop and they are easy to do! Fantastic cards! Love each and every one!! !